2019 Apple Festivals in Washington State - Where, When and More to Find an Apple Festival Near You! Looking for a apple festival in Washington State in 2019? (just scroll down the page)There is no other listing as complete and current as this list, just updated! 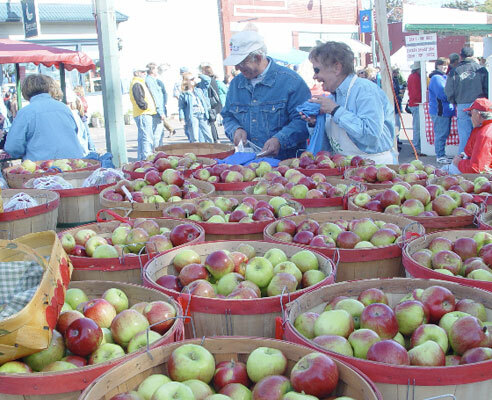 All the apple festivals in Washington State we can find are listed on this page! If you love strawberries, look for a festival near you below! And I'm always looking for more apple festivals! Please write me, if you know of any to add! I update the dates as soon as the festivals publish their information, but you can always click on the links (usually the name of the festival) to see the current information on the festival's own website. Downtown Steilacoom, Steilacoom, WA 98388. Enjoy the sweet aroma and taste of fresh squeezed apple juice and many other apple food items! The festival of the apple will have 20 presses running for cider squeezing. On Lafayette Street, vendors will be offering their wares and food items. Green Bluff Apple Festival - held over six weekends. Spokane area, WA. Apples, fresh pressed cider, and other produce, live music, great food, craft booths, corn and straw mazes, and animals. Old Apple Tree Park, Columbia Way just east of Interstate 5 Bridge, Vancouver, WA. Phone: (360) 487-8308.The annual Old Apple Tree Festival is a celebration centered on the oldest living apple tree in the Northwest, planted at Fort Vancouver in 1826. Providing family fun, food, music, and history of Vancouver's Old Apple Tree, the festival celebrates our community and it's rich heritage. Throughout the day Urban Forestry Commissioners give away cuttings from the Old Apple Tree; cuttings are limited and will be given out until they are gone. This is a free, family friendly event with activities for children, fruit tree pruning workshops, food, live music, cider pressing, a hard cider tent, and walking tours of Fort Vancouver. Fort Vancouver Antique Equipment Association will be on hand with rope making and corn grinding activities. This year the festival will once again feature a community apple cider pressing hosted by Urban Abundance. Bring your own apples and a clean container to catch your fresh cider. Approximately 12 lbs of apples will make a quart of cider. Interested in volunteering at the cider pressing booth? Contact Urban Abundance to learn more. Celebrate the oldest living apple tree in the Northwest, planted at Fort Vancouver in 1826. Enjoy the trees, apples, and cider amidst the National Historic Site setting, plus live music, tree care workshops, tours of the Vancouver land bridge, kids activities, apple press (bring clean apples and containers to participate) and more! A limited number of tree cuttings from the Old Apple Tree will also be distributed. Onalaska, WA. Thursday and Friday night Royal Court kicks off the weekend festivities with BINGO and Coronation. Saturday Saturday is a full day of Parade, Vendors, Food, Music and Family Activities you won't want to miss! Sunday finishes off the weekend with the All-area Community Church Service, the 2nd annual Farm & Homestead Tour and Farm to Table Dinner. Live Entertainment, Pie eating contests, Vendors and Booths, A wonderful Parade, Activities for the whole family, Pancake Breakfast, 5k Apple Fun Run/Walk, Canoe and Kayak Races. Wenatchee, WA. "Apple Bin Rally" races! Enter your best apple dessert in the the Apple Dessert contest. Apple pie eating contest, apple tasting, horse drawn wagon up, children's activities in Centennial Park, performers, vendor booths, live music and a beer garden at the Convention Center Plaza. Event dates: Festival runs from 10:00 am to 6:00 pm. Wenatchee, WA. Click here for a link to our Facebook page. A visitor writes on November 04, 2018: "The Wenatchee Apple Blossom Festival may be the largest Festival of i's kind in the US. There are bands, floats, drill teams and dignitaries from throughout the state of Washington. It is held on the Saturday of the first weekend in May. I'm not sure, but next year may be the 100th anniversary of the Festival.. I grew up there and participated in the parade. For detailed information, I suggest you contact the Wenatchee Chamber of Commerce. The Wenatchee Valley and the surrounding area growes a significant amount of the nations apples. Wenatchee is known as The Apple Capitol of the World. Tree Top Applejuice has a large plant there and my brother works there. They actually make dried apples there for use in many food products. There is also a carnival, bands, and food venders. "